What was your life like prior to starting seeking? What I'd describe generously as semi-conscious seeking began when I "woke up" as a college senior to the boring prospect of working an 8 to 5 job five days a week for the foreseeable decades. Over the next 10 or 12 years I experienced periodic identity crises, as I thought of them, where I'd be flooded by feelings that my life was missing some purpose or meaning. But I would scan the horizon for what might fill that hole, and nothing that I could conceive of sounded satisfying. What got you interested in seeking? My wife and I had taken our kids to the local library one rainy Sunday, and she spotted a poster that she thought I'd be interested in. It was for a Zen group meeting at the local university. It took a full year before I finally got to one of their weekly meetings, which took place when classes were in session during the fall, spring and winter academic quarters. The group had formed when Richard Rose gave a public talk at the university a few years earlier. When he attended a meeting several months after I became a regular participant, he rang an inner bell I didn't know even existed. 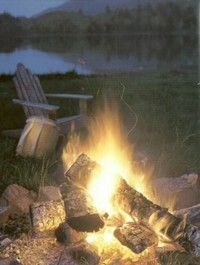 I credit that bell-ringing with an awakening of my intuition to the prospect of finding what I was looking for, within. As seekers, we often notice, but cannot get over our delusions or beliefs. Were there any particularly traumatic or funny ones that stood out on your path? As Charlie Chaplin was quoted as saying, life is a tragedy in close-up and a comedy in far shot. When I was seeking to find my true or real self, I was pretty much stuck in close-up. Every il- or de-lusion that got popped lifted a weight from me, but I don't recall any that were particularly traumatic or funny. I was a rationalist, though, and thought feelings were something to deal with (as opposed to something simply to feel), so I'm sure that helped obscure the reactions I felt to those belief balloons popping. During your seeking, what did you think the path was all about? I was tremendously fortunate in having a teacher who'd been all the way down the path, so I didn't have any pie-in-the-sky fantasies about the path. I knew it would take determined effort with no guaranteed payoff. But I also felt rather sure that I would not regret a life dedicated to searching for my real self regardless of whether the search proved successful. Looking back, what would you say the path is all about? What is the work that is to be done? Can we gauge progress? I'd say that the path to Self or Truth or Reality is subtractive, shaking off or seeing through faulty beliefs that obscure the truth or prevent us from accepting the truth that is always in plain view. Those faulty self-beliefs keep us asleep to the truth. The work is to wake up. There are a few discontinuities along the way that we see in retrospect as milestones. While we're on the path, though, it's difficult to gauge progress. After 25 years of effort I went through a period of feeling like I was right back where I'd started. Fortunately I had some friends whom I was working with who could provide contradictory views. What advice would you give out to someone just starting on the path? The only thing I can say for sure that's needed is determination to keep going even though there will likely be periods, maybe lengthy ones, of discouragement. And then keep going even when you get to the point of seeing there's nothing in it for you. Some teachers say it's all quite simple and obvious, which we today know best as the neo-advaita. What is your view on this type of teaching? Any belief is a potential trap. Was Art changed by the path, by the final event, or both? What happened to your suffering? Art's pretty much the same, although he can afford to feel his feelings deeply these days since there's no threat of extinction hanging over his head. He knows that he never really existed :-) He's still programmed to continue existing, though, and possibly every cell of his body shares that programming. Art  the bodymind self  still feels pain and pleasure. I am beyond or before or behind movement. There's no suffering where I am. You often mention that as a seeker you were more linear, logical, rational. Looking back, what is the place of rationality on the path? Most seekers, I suspect, lean either toward feeling or toward rational thought as their weapon of choice to try to get what they want from the world. Franklin Merrell-Wolff, a very rational guy, concluded that Buddha was the world-class teacher who had been the most balanced between the two extremes as a seeker, while Jesus was primarily on the feeling side and Shankara primarily on the thinking side. Using both thought and feeling would be great, but I suspect that most of us will stay pretty much in one rut or the other for most of our seeking. Intuition is what I believe determines progress. Intuition shows up somewhat differently in feelers and in thinkers. My advice would be for thinkers not to be afraid of intuition and for feelers not to believe all feelings are intuition. You are known for your skills in seeing the blocks of seekers and confronting them without too much fuss. What is the method of confrontation all about? The best confrontation is self-questioning. Our faulty beliefs mostly fly under our radar, so it's hard for us to get them into view for questioning. Working with friends can accelerate the process. Most of the helpful confrontation probably occurs by accident. What do you know for sure? What is enlightenment? Are you sure? The only thing I know for sure is what I am. Enlightenment is an open channel between the self-conscious mind and Awareness. The individual self of the bodymind recognizes that its existence, as the word literally means, is a "standing outside of" its core being. Human death is like a faster version of the death of a boulder. I am your "original face" before you were born. Why do you teach? How do you teach? it's an obsession." He had a dry sense of humor that I've never seen surpassed. The best explanation I can come up with is the same thing that seemed to move me along the path: momentum. I started leaning in a direction and couldn't stop. My attempts to help other seekers seem to be more of the same: stumbling along in the hopes that something will work. Another, prettier, description might be: faith. A more vanilla description might be: it's what Art's programmed to do. What would you say to a seeker that despairs of ever finding what she's looking for? as long as you keep on with the quest. Working without any hope of reward is the final stage of the path. Be thankful if it's quick or easy, but don't expect it to be. What/where is the truth? Is it far away? The Truth is that which is beyond reach by any except itself. 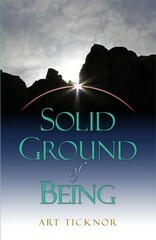 You can use the search-inside feature on Amazon.com to preview the contents of the Solid Ground of Being. Stumble It! In addition to Amazon.com, Half.com and BookFinder.com are good sources of new and used books.